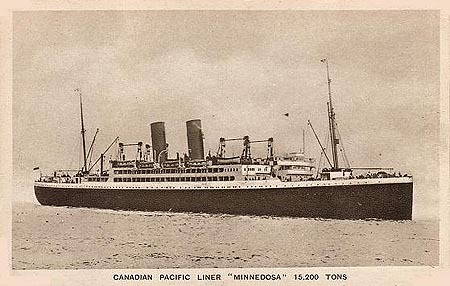 The "Minnedosa" [MINNEDOSA von Antwerpen] was ordered by the Hamburg America Line in 1913, but was taken over by Canadian Pacific before completion. She was built by Barclay, Curle & Co Lts, Glasgow (engines by Harland & Wolff, Belfast) and was a 13,972 gross ton vessel, length 520ft x beam 67.2ft, two funnels, two masts, triple screw and a speed of 15 knots. There was accommodation for 550-cabin and 1,200-3rd class passengers. Although her keel was laid in 1913, she was not launched until 17/10/1917 and on 2/5/1918 was towed to Belfast to have her engines fitted. On 5/12/1918 she commenced her maiden voyage from Liverpool to St John, NB and on 13/12/1919 started a single round voyage from the UK to Bombay for the British government. On 21/6/1922 she commenced her first voyage from Antwerp to Southampton, Quebec and Montreal and in 1925 was refitted by Hawthorn, Leslie & Co Ltd, Hebburn-on-Tyne and her tonnage increased to 15,186 tons. In June 1926 she had accommodation for 206-cabin, 545-tourist and 590-3rd class passengers. She commenced her last Antwerp - Southampton - St John NB - Liverpool voyage on 30/3/1927 and was transferred to the Liverpool - Quebec - Montreal route on 29/4/1927. On 27/6/1931 she started her last transatlantic crossing from Glasgow to Quebec and Montreal (129 Atlantic round voyages) and was then laid up in the River Clyde. In April 1935 she was sold for scrapping and was towed to Savona, Italy, but was bought by Italia Line, renamed "Piemonte" and used as a troopship. On 15/8/1943 she was scuttled at Messina, salvaged in 1949 and towed to Spezia and scrapped.